The simplest approach to changing the USD theme is to use one of three standard themes provided by Microsoft. Goto events and select the “DeskTopReady” event. Add a new action call like the one below. Data = Whichever theme you want to apply from list above. This gives a theme like the one below. USD – Theme, change the window title. 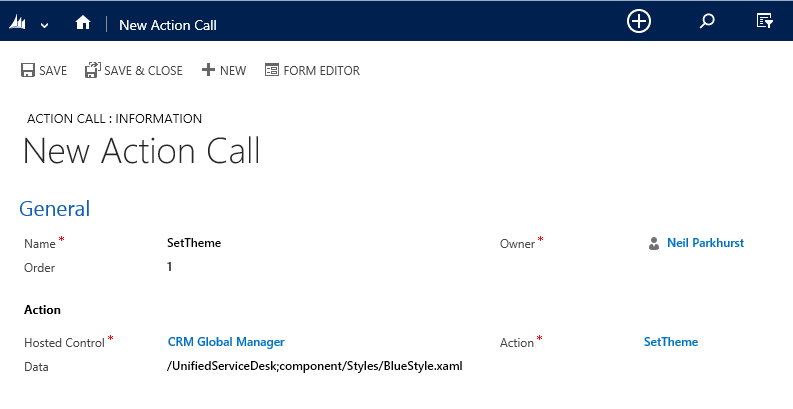 Missing your posts on “Microsoft Unified service Desk” 😦 “I have one question which is hover these days in my mind which is that I want to implement Reminder which is the Microsoft CRM “Announcement” inside the Microsoft USD ? How do you want the announcement to work / show in USD? I assume you mean CRM annoucements?